Preparing African Warriors to Meet the British Among the 30,000 runners in Sunday's London Marathon are six Maasai warriors. In anticipation of their trip, the conservation charity Greenforce prepared a pamphlet to help the Maasai meet the strange residents of London. What would you tell the Maasai? Six Maasai warriors have left their village in Tanzania for the first time in their lives. On Sunday, they will be among 30,000 people running the London Marathon. The Maasai aren't running for glory, but to raise money to build a drinking water well for their village. Even though some may look like they have a frown on their face, they are very friendly people — many of them just work in offices in jobs they don't enjoy and so they do not smile as much as they should do!! 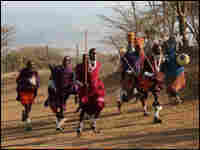 Although English people share a lot, they do not do so to the same extent that the Maasai do. If you see something that someone else has (like a bracelet) and you like it, then the person will find it very unusual if you were to take it and wear it! Greenforce managing director Marcus Watts says of all the eventualities his group anticipated, London's weather is one that defied careful planning. When a blanket of fresh snow fell overnight in greater London, the Maasai were in for a sight. "Suddenly all the grass was white, a phenomenon they'd never seen before," Watts says. Whatever other superlatives await during the 10-day trip, Watts says, it's unlikely the warriors will post low times at the marathon. "They'll run with swords and shields," he says, adding that back home, they sometimes run for 14 to 15 hours while rounding up cattle. It's all about stamina. Watts says their trip will live on for a long time. "They can't write," he says, explaining that instead, the six have been gathering each night, staying up for hours, sharing reports about what they've seen in England. It's preparation, he says, for all of the storytelling they'll do when they return. "I know these stories from their visit to London for 10 days will probably be told for generation after generation."